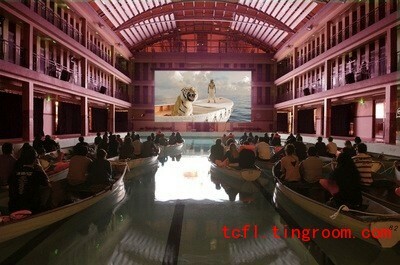 Ang Lee's "Life of Pi" is an unusual movie, taking place mostly in a lifeboat at sea with a tiger and a young boy. Appropriately, Twentieth Century Fox has given it an unusual premiere. On Wednesday, the studio debuted the Oscar hopeful in Paris in a location best designed to bring the audience along for Pi's journey. Not in a theater with cushy seats, but in an indoor swimming pool, with the moviegoers nestled in lifeboats, just like Pi. The 1930s-built Espace Sportif Pailleron is one of the city's listed buildings and features a recently restored Art Deco interior as well as Paris' only permanent ice rink. But the crowd for Lee's film didn't get to swim or skate. They were placed in the boats with life preservers in the 108-foot-long pool and shown the picture. There's no word on how the crowd handled bathroom breaks during the 2 hour, 7 minute movie. How do I get out when I need to run to the bathroom? Did each boat also have a bengal tiger in it? I would undoubtedly feel seasick.